This is something we could have put together as likely, using previously known information. But with the declassified portion of the Grassley-Graham memo now available — which quotes directly from a Steele memo that hasn’t been released previously to the public (but which the FBI holds) – it looks like it did indeed happen. As explained in greater detail below, when information in those classified documents is evaluated in light of sworn statements by Mr. Steele in British litigation, it appears that either Mr. Steele lied to the FBI or the British court, or that the classified documents reviewed by the Committee contain materially false statements. That is concerning enough. There will probably be more to say about the senators’ memo (which they have asked the FBI to have further declassified, so that the public can see what they have been able to review). But this post will focus on the single point, laid out on page 6, that Steele received information from an associate of the Clintons in October 2016, which he apparently incorporated in his dossier on Trump-linked individuals. The only reason I say “apparently” is out of an abundance of caution, since the paragraph in question is partially redacted. But the senators conclude from their unredacted review that this is what happened. And the visible wording directly supports that conclusion. One memorandum by Mr. Steele that was not published by Buzzfeed is dated October 19, 2016. The report alleges [redacted], as well as [redacted]. Mr. Steele’s memorandum states that his company “received this report from [redacted] US State Department,” that the report was the second in a series, and that the report was information that came from a foreign sub-source who “is in touch with [redacted], a friend of the Clintons, who passed it to [redacted].” It is troubling enough that the Clinton Campaign funded Mr. Steele’s work, but that these Clinton associates were contemporaneously feeding Mr. Steele allegations raises additional concerns about his credibility. A screen cap of the memo with the redacted portions blacked out is below. We have known enough for some time to find that the possibility outlined in this paragraph is credible, and tallies with previous information. First of all, we looked last week at the Guardian’s report of a “second dossier” compiled by longtime Clinton crony Cody Shearer, a man with a most unusual résumé. In an interesting coincidence, the “Shearer” dossier was provided to the FBI in October 2016. Oh, and it was provided to the FBI by Christopher Steele. But apparently, Steele didn’t just pass it on to the FBI. He put it in his own dossier, according to the Grassley-Graham memo. 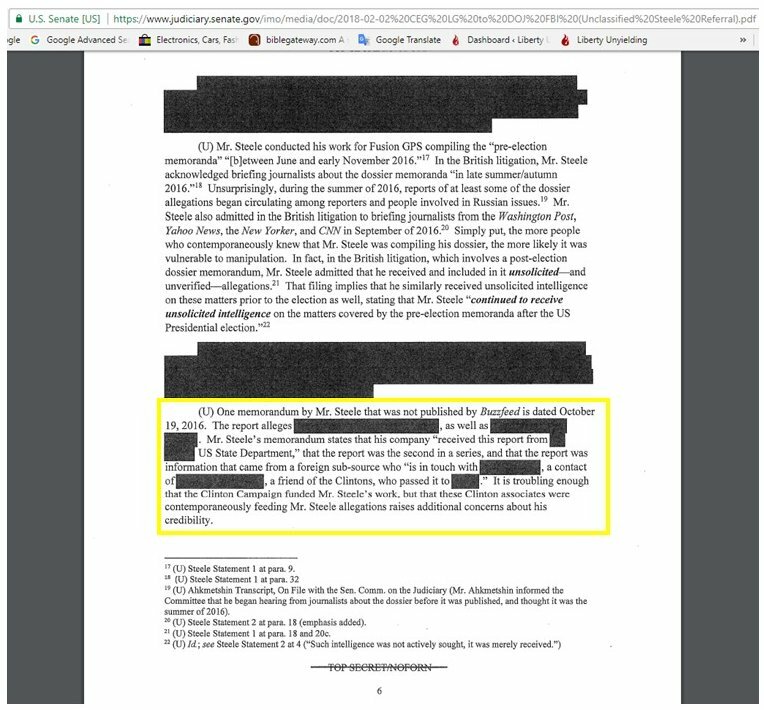 If you look at the extant version of the Steele dossier – the one published by BuzzFeed in January 2017 – you see that there is a reference to a 19 October 2016 entry, of which we seem to see only a summary. In other words, the full memo from the date 19 October 2016 is not published in the dossier version the public has access to. That comports with the senators’ statement that the memo with that date was not published by BuzzFeed. We have never seen it; only the FBI and members of Congress have. Steele passed him his report. Was this the identical, somewhat sputtering 35-page memo that had already been making the rounds among reporters? Or, as some intelligence analysts believe, was it a longer, more expertly crafted and sourced document, the final work product of a well-trained M.I.6 senior deskman? Neither McCain nor Kramer would comment, but what is known is that Kramer flew back to Washington that same night, guarding his hard-won prize with his life. 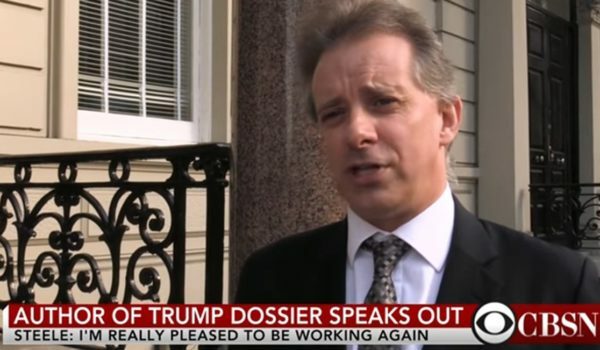 Pseudonymous blogger “Grace Laine” took up this forensic challenge, and organized the format for a potential complete Steele dossier, based on the numbering convention of the version published at BuzzFeed. I’m a bit dubious about the blogger’s suggestion that 79 entries are missing, in the published version, from the beginning of the complete dossier. 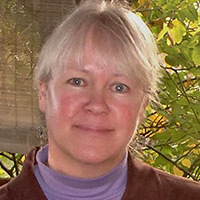 (Its first memo is numbered “2016/080.”) Aside from the “startling” nature of the omissions, noted by Grace Laine, it seems likely that Laine’s conclusion is correct that the numbering convention has to do with dates. But clearly the convention isn’t about sequential calendar dates. As Laine observes, the numbers in the published version skip from 2016/080 on 20 June 2016 to 2016/086 on 26 July 2016. Far more than six sequential calendar days are included in that interval between published memos. It’s possible to make a sensible case for the second number in each entry having to do with work-day billing in the contract between Fusion and Steele. But there’s no need to spend a lot of time on that; we’re looking at it from the outside, and can’t be certain. Section 14: “2016/134” – Dated 18 October 2016. Four sections appear to be missing with a gap of less than one week from the previous memo. Section 15: “2016/135” – Dated 19 October 2016. This sections runs in sequence and again indicates Steele was producing memos on a daily basis. Section 16: “2016/136” – Dated 20 October 2016. There is no gap with this memo either in time or sequence. However, the published version is inexplicably inserted after the 10 August memo (2016/102). 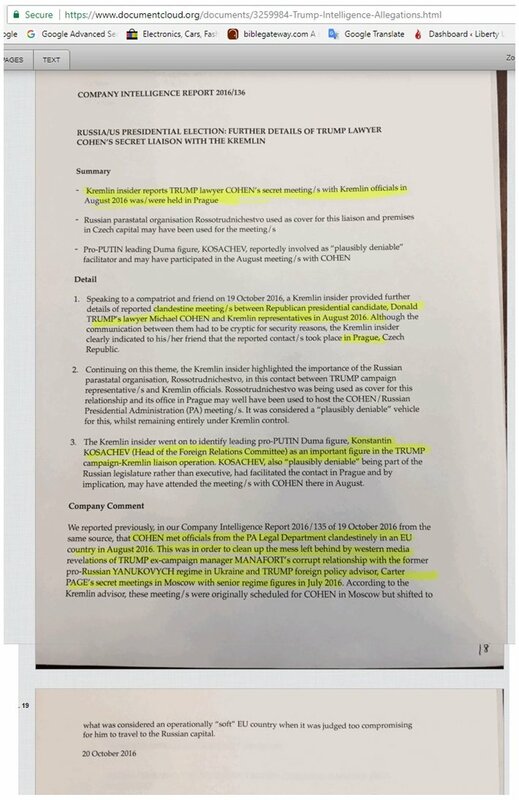 The version published by BuzzFeed has the 2016/136 memo with a summary reference to the 2016/135 memo of 19 October 2016. Grassley and Graham are right to be concerned about this. Hillary Clinton was running against Trump for president, and paying Fusion and Steele to dig dirt on Trump. 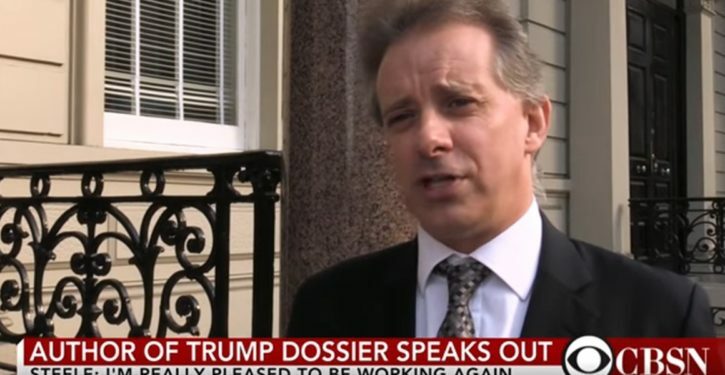 Her associate – presumably Cody Shearer – was also passing information to someone in or linked to the State Department, which Steele then received and (a) incorporated into at least one of his own dossier memos, and (b) forwarded separately to the FBI. Would there have been something wrong with Hillary sending her own lawyer to give the FBI information dug up by a paid operative for her campaign, if she thought it was a national security concern? No. But that’s not what she did. Instead, it’s highly probable that her old crony Cody Shearer funneled what was essentially oppo research through the State Department, and thence to Steele. The appearance was that it came from Steele – the ex-MI-6 agent and credible source for the FBI. Presumably, in fact, the appearance was that someone in the State Department thought it was credible too. We don’t know if the FISA application from the FBI used information funneled from the Clinton associate through Steele. Grassley and Graham mention only the 19 October 2016 memo in their letter to Rosenstein, and that memo’s data may have come in too late for incorporation in the FISA application (whose date has also been reported as 19 October 2016). On the other hand, Steele had been in contact with the FBI and passing them information since at least 5 July 2016, so he may well have provided that Clinton-crony-sourced information to the FBI informally, before the date of his 19 October memo. It certainly has the whiff of credibility-washing from here. The implication is that the purpose of funneling pieces of “information” through Steele (perhaps with the added “credibility” aura of circulating it through the State Department) was to position allegations from oppo research to actually affect the FBI’s activities, with a seeming imprint of legitimacy. I appreciate and endorse the senators’ desire to have as much as possible declassified, so that the public can see what they have seen, and judge for ourselves what really happened. Given how much of this saga amounts only to what Steele, Fusion, Shearer, Hillary, the DNC, and specific people within the DOJ and FBI were doing, there are few if any national security secrets at issue here. There is mainly the desire to shield the truth — truth about people who were acting in political roles, not in national security roles — from the American people.